For a second week in succession Australia’s Scott Hend is flying high near the top of a European Tour leaderboard with just three shots separating him from near the very front seat at the KLM Open. Hend had bravely lost out in a play-off at last week’s Omega European Masters and denied a third victory this season when Swede Alex Noren holed an outrageous 20-foot birdie putt at the first extra hole high in the Swiss Alps. But then the big Queenslander has not given up hope of what would be a first win on European soil with scores of 67 and 68 on the Colin Montgomerie ‘The Dutch’ course at Spikjk in Holland. Hend’s second round was a mix of five birdies and just two bogeys to be well in sight of Austrian Bernd Weisberger who has signed for a pair of 66s to be at 10-under par. While Hend is renowned as one of the longest hitters in the game it was his approach play that proved to be the key on day two in hitting 15 greens in regulation. “I’m happy with my two rounds as I’m in a good position going into the weekend,” he said. “The key for me so far is staying patient as I am trying to figure out the golf course, as it’s a brand new golf course and today was only the third time I’ve played it. “I am trying to find out where to position the ball appropriately. I am trying to figure out and where to attack pins. The thing also since we played the Pro-Am the golf course has dried out a lot more and the ball is running out a bit more towards the water hazards. And when asked about last week’s near miss in Switzerland Hend responded: “It was very disappointing as I got beaten by a great birdie on a play-off hole. And like I have said many times before, it’s unfortunate when after 72 holes two guys can be tied for the lead but then there can be only one winner. 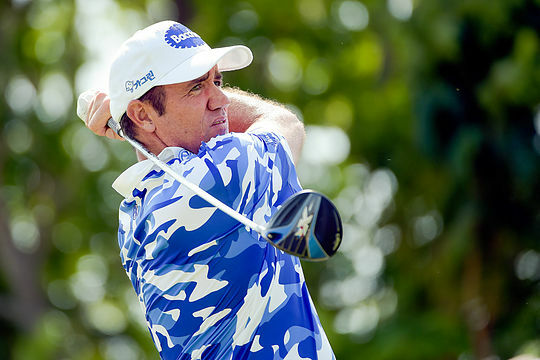 And it is clear that Hend’s reuniting with former Australasian Tour player, Tony Carolan is reaping dividends. Carolan has spent the past few months with his wife on ‘Outback’ Tour. “Tony and I know each other well and he’s a great golfer himself and it’s a lot easier for both of us to make decisions,” he said. Hend’s Rio Olympic Games team-mate, Marcus Fraser birdied three of his closing five holes in a round of 68 to make the one-under par cut right on the mark.